No turning back now! 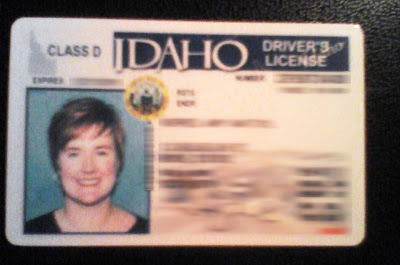 I'm officially licensed to drive by the great state of Idaho. I passed with an 85 percent! AND I actually like my photo! The lady asked for my eye color..."Blue." And hair color...red? "Uh..sure..."
It was really hopping down at the DMV on Friday. The folks lined up at the concealed weapons desk were nearly pouring out the door! Kansas: Good Times, Great Food, Fabulous Company! Kansas: The BBQ Capital of the World! Kansas: Visiting the Whole Family! Layover in Denver: Dinner with Kelly! The Paris of the Plains! Congratulations Mom on 10 YEARS smoke-FREE!